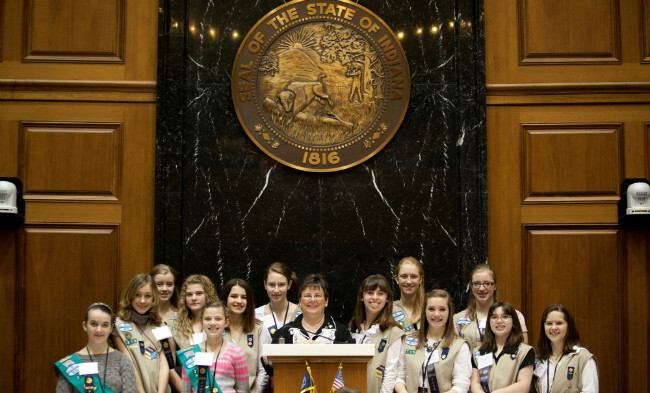 In Indianapolis, Fox 59 WXIN reports that Girl Scouts of the USA were recognized Friday by the Indiana House of Representatives in honor of their 100th year anniversary. Girl Scouts of the USA is grateful to the entire Indiana State Legislature for unanimously voting in favor of our 100th Anniversary resolution last week and for recognizing the great contributions members of Girl Scouts have made in our communities for nearly a century. However, Representative Bob Morris is refusing to sign a resolution to honor the 100th anniversary of Girl Scouts of the USA and actively trying to get his fellow lawmakers to oppose the measure, too. Regarding Representative Bob Morris—if the freshman representative wishes to discredit the contributions that hundreds of thousands of Indiana women and girls have made through the Girl Scouts program over the last 100 years, then he is entitled to his opinion. Not only is Representative Morris off the mark on his claims, it’s also unfortunate in his limited research that he failed to discover that since 1917, every First Lady has served as the honorary leader of Girl Scouts including Nancy Reagan, Barbara Bush and Laura Bush. We believe that leadership is about hearing from all sides of an issue before making up one’s mind. We only wish we had the chance to speak with Representative Morris before he distributed his letter.